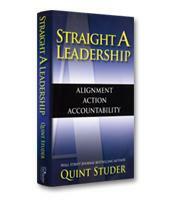 Wall Street Journal best-selling author Quint Studer takes readers on a journey to leadership excellence. Executives will learn the three guiding principles of Studer's philosophy: alignment, action and accountability. Packed with relevant examples, this Featured Book Review attempts to provide a handy overview of Studer's major points.